Ted Cruz just released a new online video titled “The Stakes,” which sets the stage for an upcoming series comparing and contrasting his record with Lt. Gov. Dewhurst’s. Dewhurst held a reception just last week at the private home of Tony Podesta, one of the top Democratic lobbyists in DC. Although he is not in Washington, Dewhurst already exemplifies the ultimate RINO Washington insider who is too eager to rub elbows with the liberal establishment. Ted Cruz is the real conservative running for Senate in Texas. As Solicitor General of Texas from 2003-2008, Cruz authored 80 U.S. Supreme Court briefs and personally argued 40 oral arguments, including 9 before the Supreme Court. Named “a Republican star rising in Texas” and “a great Reaganite hope” by the National Review, Ted Cruz has led the fight against Obama’s offshore drilling moratorium and for private property rights for Americans. His “Growth and Jobs Agenda” promotes a limited government plan that pledges to repeal ObamaCare and Dodd-Frank, kill Cap and Trade, and dramatically simplify the tax code. Cruz knows the value of hard work and the importance of economic freedom in achieving the American dream, and he will be a champion for these principles in Washington. 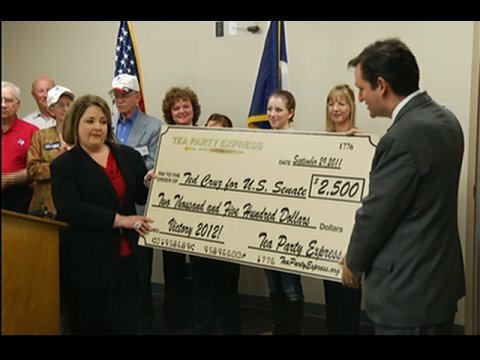 We must send a true conservative like Ted Cruz to Washington, not another RINO like Dewhurst. But to do so, Ted needs our help. Cruz’s average donation has been $319, while Dewhurst’s has been $2,286 due to his connections with people like Podesta and to the fact that he can write himself huge checks. Please share this video on Facebook and Twitter, and let’s send a real conservative from Texas to the U.S. Senate.